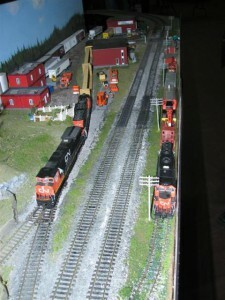 I put some photos I took at last Saturday’s model train show in Saint John in my photo gallery. As usual the Saint John Society of Model Railroaders did a fine job organizing the event. The usual displays were there, with the SJSMRR modular display front and center. For the four and under crowd, my daughter liked the O scale displays on the left of the venue as well as Hazen Middleton’s Thomas train and the Bugs Bunny/Daffy Duck speeder. I enjoyed the chance to talk with some old friends, like Bill Linley, Ron Grant, Art Clowes and Tim Dryden. 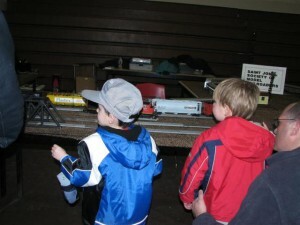 I didn’t buy much – two covered hoppers for $5 each and a little toy engine for a quarter.